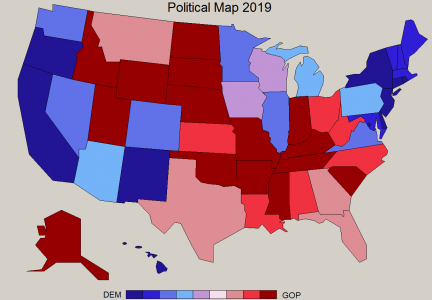 The many solid blue or solid red states are an indication of the polarization that has occurred in our country in recent years, and I believe it’s unfortunate. However, the states with colors in between are proof that candidates of both parties can be elected there. It was compiled in the following way. I gave one point each for Republican office holders in the position of U.S. Senator or Governor, one point for those states that went for Trump in 2016 and one point for each quartile of the state’s GOP Congresspersons. In other words, if the state had 75% or more of its representatives Republican, it got three points; if 50% or more, 2; 25% or more, 1; and less, 0. Thus a state could get from 0 to 8 “redness” points. Of course even the deep blue or deep red states might have some Congresspersons of the opposite party, just fewer than 25%. It also doesn’t take into account mayors, state officeholders, or voter registration, so it’s by no means definitive. There are also a couple of elected Independents in the mix. I am both surprised and dismayed at how few states are in the middle, only two purple states and three light blue. I do not contend that this is good or bad, nor is it likely to predict anything for the 2020 national elections. Students of political science would be well-advised to consider the effect of demographics on this type of map. States in the red category especially, such as Florida, for example, may not be as red as they look for purposes of a presidential election. Democratic voters tend to be concentrated heavily in small areas such as major cities. 700,000 Democrats in an inner city district may elect one congressperson, while 700,000 Republicans spread in suburban or rural areas might elect two, but in a presidential election, the vote is split 50-50. Gerrymandering tends to accentuate this even more. This entry was posted in Uncategorized on January 25, 2019 by Russ.